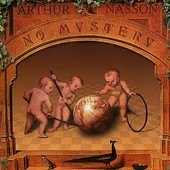 Arthur Nasson's No Mystery is a decent singer-songwriter pop record. The vocals don't live up to the pop hooks at times, and at other times the pop hooks are stale. However, No Mystery has its moments. The songs can be bright and fun; they possess warmth and charm and, if given the chance, grow on you until you find yourself connecting with Nasson and his songs. Though he has a long way to go, his brand of loose pop-rock has a dance to it step, which can be infectious. I'll give it a C-.